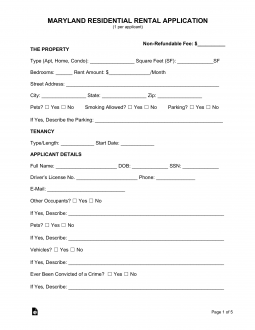 The Maryland Rental Application Form gives residents of this state a paper framework for the application process involved in attaining a property. This process will require the prospective candidates to divulge quite a bit of sensitive information about themselves. Additionally, there will be a verification and consent line the candidate must sign. This is a standard line on most rental applications. A landlord or property manager’s top priority is to find a reliable tenant who will pay his/her rent on time, return the property in the condition it was leased in, and obey the laws and rules of the premises. This rental application will ask the tenant questions to verify their viability in these aspects while the signature binds the prospective tenant to the information presented being true. The consent portion will give the landlord the permission in checking any references provided, running a criminal background check, and a credit check. These steps are taken to ensure the beneficial habitation of all those living on the property. To tenants submitting this application, it is important to be clear about the full application procedure and all fees that are involved. Some may be refundable while others may not. It is up to the property manager and the tenant to be clear about this. Step 1 – At the top of the page, enter the application date, the address, the monthly rent you are applying for, and the security deposit that accompanies it. Step 2 – The first section of this application will require the applicant to provide some information regarding his/her identity. In the left column, enter the full name of the applicant, date of birth, social security number, driver’s license number, issuing state and expiration date. If there is a co-applicant then, in the right column enter the co-applicant’s full name, date of birth, and social security number. Step 3 – On the two lines below the identity section for the applicant(s), enter the full name, telephone, and address of any emergency contact(s) the applicant(s) may have. Step 4 – Finally on the last line of this section, enter the name of every person who will be living with the applicant. Step 5 – The next section will require information about your current and prior residences. Starting with the blank line labeled “Current Address,” enter the street address, city, state, and zip code where you currently live. Step 6 – On the next line enter your current phone number then the community name where you live. Step 7 – On the third line, enter the rental rate where you live, the lease expiration date, and the manager’s name. Step 8 – The next line will require the property manager’s phone number and the period of time you have lived at your current address entered. Step 9 – On the line starting with “Why are you moving?” give a reason for why you must leave your place of residence. Step 10 – Below this, report how you chose the community you are applying for. Step 11 – The next area of this section starts with the line labeled “Prior Residence.” Here, the first three lines will require similar information as that provided in the previous area: street address, city, state, zip code, community name, rental rate, lease expiration date, manager’s name, phone number and how long you lived there. Step 12 – Below this will be an area where you may indicate whether you have ever been evicted and if so, why and from where. Step 13 – On the last blank line of this section, report if you have ever been unable or unwilling to complete a rental contract you committed yourself to. Step 14 – The next section will deal with your employment status. That is, how you will pay for your rent. In the first area, “Current Employment,” enter your current employer’s name, supervisor’s full name and phone number, company address, the position you hold, the years you worked there and your current income. Finally enter if you foresee any event that may prevent you from earning enough money to pay the rent if granted a lease. Step 15 – In the area with the heading “Previous Employment,” enter the employer you worked for (before your current employer), previous supervisor, that supervisor’s phone number, the past employer’s business address, the position you held there, how many years you worked there and the salary/wage you earned. Step 16 – Below this will be the heading “Other Income.” Here you may report any additional sources of income you command. There will be room for two of these situations however all should be listed. In each entry report the source, type, amount, frequency, contact person and phone number. Step 17 – Under the “Vehicle Information” heading, enter the year, make, color, license plate number, and issuing state of any vehicles the occupants of your household have. Step 18 – The paragraph below the “Vehicle Information” section will require the non-refundable application processing charge entered and the amount of good faith deposit left to hold the rental property. Step 19 – The bottom of this application will have a consent line to allow for the property manager to conduct a background and credit check. Following this will be two questions. Here indicate if you or anyone in your household has been convicted of a felony or a drug crime in the first question. Then in the second question indicate if anyone in your household is required to register anywhere as a sexual predator. Finally, sign your name and provide a date for the signing.